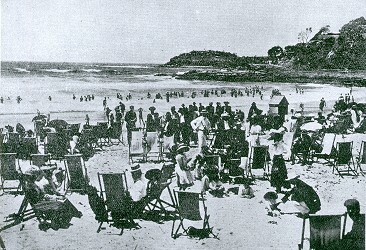 Alexander Hume Ford : Beach Culture in Sydney, Australia, 1908. Ford, Alexander Hume: Australia Through American Eyes. 27 Rattay Street, Dunedin, New Zealand. Alexander Hume Ford was an enthusiastic promoter of Hawaii and surfriding and is best known as the instigator of the Outrigger Canoe Club at Waikiki in 1908. His significant contribution was initiating the acquisition of coastal property, giving the club a tangible identity. The premises provided a centre for administrative and social activities in addition to beach front storage for surfboards and/or accesss to an extensive range of surf craft, probably the most important function for active members. Ford was possibly influenced by Sydney's fledging surf lifesaving clubs on his visit there in 1907-1908. To consolidate their public status, the clubs were actively petitioning their local councils for the provision of beach front property, ostensibly in recognition of their voluntary community service. 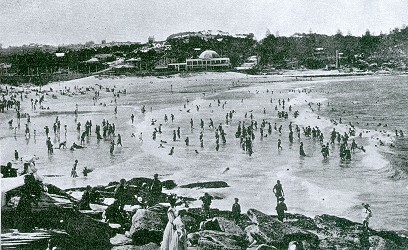 During 1907, the precedent (one of many) was set by the Bondi Surf Bathers' Lifesaving Club when it was granted permission to construct premises in the beachfront park by Waverley Council. The council also contributed substantial funds, and the first Bondi clubhouse was operational by October. At Waikiki, Ford would substitute voluntary community service with the conservation of a traditional art, integrated with its promotion as a tourist attraction, as the Outriggers' raison d'etre. He wrote more than half a dozen articles on surfriding between 1908 and 1926, mostly published in Hawaiian, but some mainland US, magazines. Ford was a principal character, along with George Freeth, in Jack London's celebrated account of surfriding at Waikiki in 1907. 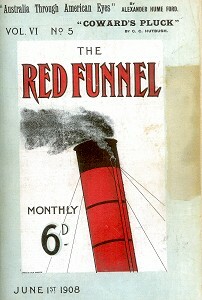 Ford's onshore activites are further detailed in Chairmain London's Our Hawaii (1917). For extracts, see Charmian London: Surfriding at Waikiki 1907-1917. I did not neglect Sydney's front-yard during my several sojourns in the city. Manly Beach is not unknown in America. In fact, the moment I left the surf at Waikiki behind I looked forward to Manly. I pictured myself on a surf-board, riding in on the crest of the waves and bidding defiance to the sharks, as is the custom in Hawaii. At fashionable Waikiki, men, women, and children- white, yellow, and brown- all bathe in the same breakers and bask upon the same strand. No one suspects that improprieties are even possible. There is no policeman ever at the beach, and no need that I there should be. Moonlight surfing parties are common, and it is the fashion to have afternoon tea in bathing costume under the shade trees of two of Honolulu's finest hotels- hotels surpassed by few in the world. Men and women sit down at tables to eat and converse between swims, or meet their friends who wish to pay a social call. I was enchanted, until I looked for the familiar little six-by-six dressing-room, with its door and lock; then I learned that the Australians disrobe en masse, so I disrobed "en masse" in one of the paddocks for men. As I looked around the curve of Manly Beach, however, I pictured to myself such a resort near a large American city. But no- the picture was too ghastly! Beer gardens down to the surf; no strand save under the planking of the beer g'ardens; behind the beer gardens endless avenues of little closets for bathers, who would pay a shilling each for the rent of one of these, not exceeding two hours; behind all this, screeching, ear-splitting merry-go-rounds and the thousand-and-one dives and cheap places of amusement to tempt the American to part with his dime. I prefer Manly to Coney, but why may not Manly be another Waikiki. I was arrested at Manly Beach before I had even dipped into the breakers. I had committed the un-pardonable offence of sitting in the warm sand in my bathing-suit. The policeman who arrested me explained that I was subject to a fine of five pounds. Of course, I thought he was joking, and laughed pleasantly. He didn't; and it was only my plea that I was a stranger within the gates that got me off with a warning. I dipped into the waves and shivered. The water at Manly is about the same temperature on Christmas Day as it is at Coney on the Fourth of July. ... here are rollers everywhere in the bay- not long ones, it is true, but quite strong enough for a Hawiian to come in for thirty yards or more standing on the crest of a wave- and the white man has demonstrated at Waikiki that he can quickly learn to beat he Hawaiian at his own game of walking upon the waves. Manly Beach is Known the world over; so are the rams sent forth broadcast of its shark festivals and record-breaking cross currents. Give an American city of half-a-million population such a perfect beach, and either public or private enterprise would construct a shark-proof iron fence across the bay beyond the farthest rollers. That this can be alone is demonstrated by the almost mile-long iron piers at Coney Island and at Atlantic City. These have resisted the surf for a generation. Were there danger of sharks at these resorts a few more cross-bars between the iron columns would form a network through which no shark could force its way, but which would not destroy the force of the surf. A Hawaiian friend of mine was once arrested at Atlantic City for steering an ironing-board, upon which he stood erect, on the top of a billow, in and out among the pillars and girders of the iron pier. There was no more danger of his striking one of the bathers than there is that a body surfer at Manly will impale one of the peaceful surfers at that resort. However, both in America and in Australia it seems that where you put a policeman you must expect him to be at least as great a nuisance as the imaginary ones he thinks he abates. New Year's Day I spent at Coogee. If I had experienced the frigidity of a New England Christmas at Manly, it was glorious Chicago summer at Coogee. Never have I seen so many happy faces together outside of America. ... seen women and children take their seaside holidays with doleful pleasure at Scarborough and at Margate, but everyone was happy at Coogee. If there were any ordinances prohibiting men and women romping in their bathing-costumes upon the sands, they were happily violated a thousand times over. Old folk became young again; the ocean a fountain of youth, into which everyone dipped. What if .oddlers staggered about in Nature's garb? They were happy and no one seemed shocked. No signboards warned the masses that they were suspected of committing improprieties, therefore improprieties seemed not to enter the heads of the happy throngs. As an American, how I envied Sydney her opportunities here! For decades New York neglected Coney Island. To-day she is paying millions for park privileges there that might have been hers, not so long ago, for the mere asking. A million people go down to Coney Island every Saturday and Sunday during the summer months. It is the one cool playground of the masses. To-day the beach at Coney exists only where the city has laid out its park. In Australia there seems to be a better way of doing things. I began the New. Year by taking off my hat in admiration of the Australian way at Coogee. A few hundred private bathing stalls, please, and this place would be perfection. Geoff Cater (2008) : Alexander Hume Ford : Beach Culture in Sydney, Australia, 1908.